Engagement ring designers are fabricating incredible styles to make this important ring the center of attention. From updated vintage looks to brand new designs, these rings are sure to make an impression. Danhov's award-winning Abbraccio Swirl engagement ring is an aery backdrop for a round diamond with this wildly popular pave band. There are diamonds accenting the shank of the ring and four small diamonds set in each prong. 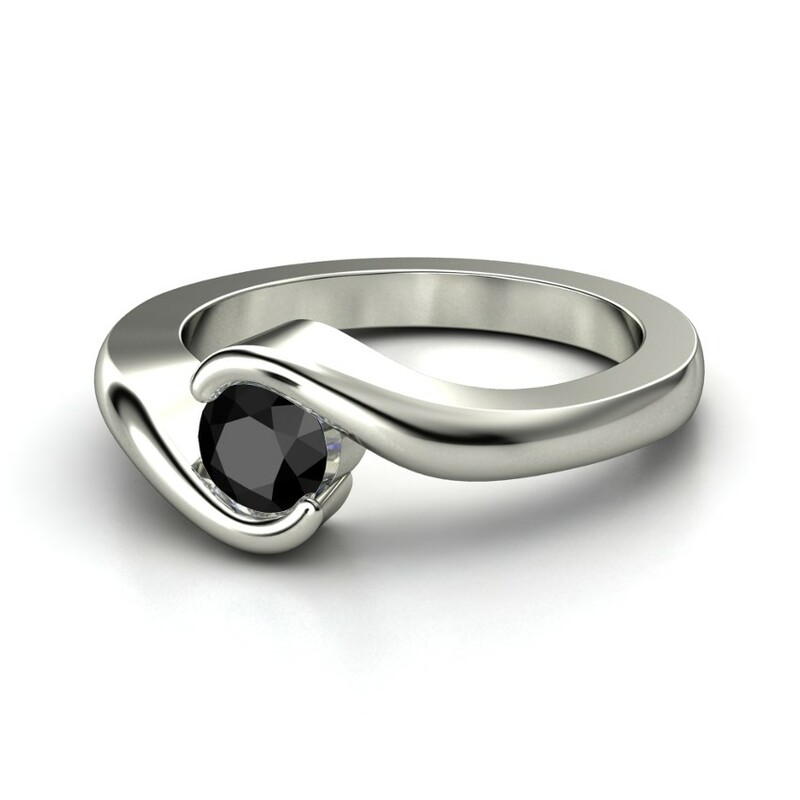 The ring is available in 18k white gold or 14k white gold or platinum. The mounting has a total diamond weight of 5/8 carats. The center diamond is not included in the retail price of close to $5,000. You can order the center diamond separately when you purchase the mounting. Jeff Cooper has been on the cusp of trending engagement ring designs for 40 years. Here, he gives a new style to the quintessential three-diamond ring mounting. The wide, polished shank curves gently to the side diamonds which are mounted in looped style settings. The mounting is available in 18k white or yellow gold or platinum. The mounting shown has a total diamond weight of .50 carats and can accommodate a round diamond from 1.20 to 1.29 carats in size. The mounting will need to be ordered from a reputable retailer that carries the Jeff Cooper line, as well as the center diamond which is not included. The mounting shown retails for around $4,500. Designer Tacori has mastered this trending favorite: the halo engagement ring. Known for using a crescent silhouette design to decorate the profiles of their rings, Tacori ensures the mounting is a work of art from any angle. The mounting contains .75 carats of round diamonds and can accommodate an emerald cut diamond from 1.15 carats to 1.35 carats in size. Order the mounting from a reputable jeweler who carries the Tacori line. The center diamond needs to be purchased separately. The mounting retails around $8,000. This mounting by Verragio puts a new twist on the classic cathedral style. The mounting has diamonds accenting the sides and profile and diamond encrusted scroll work under the centered round diamond, providing plenty of sparkle from any angle. The round, brilliant cut diamonds in the mounting total 3/8 of a carat. The mounting shown accommodates a round diamond weighing 1.15 carats to 1.30 carat. This ring is 18k white gold, but it is also available in 18k yellow gold. The center diamond is sold separately. Pick up this setting for under $3,500. This trendy Verragio split shank mounting has round diamonds accenting the sides and profile with an unusual layering of 18k white and rose gold around the shank. The profile of the shank is punctuated with bezel set, round diamonds and ringed with pave set diamonds for a truly original, modern look. The round brilliant cut diamonds in the mounting weigh a total of 1/3 carats. The mounting accommodates a round diamond weighing 1.20 carats to 1.30 carats, which is sold separately. It retails for around $4,500. This halo style mounting from Tacori features a contemporary color contrast with shield-shaped blue sapphires on each side and round, brilliant cut diamonds accenting half of the shank and the ring's profile. The diamonds in the mounting total .25 carats. This setting is fabricated in 18K white gold, but it's also available in 18k yellow and rose gold and platinum. The mounting accommodates a round diamond weighing from 1.40 carats to 1.60 carats, which is not included. Get this mounting for about $5,000. Tacori's 18k yellow gold engagement ring is a great example of the popular split shank style. The ring also has Tacori's signature crescent detailing when viewed in profile and milgrained accents. The mounting is also available in 18k white and rose gold and platinum. The mounting shown accommodates around a 1.00 carat round diamond and retails for around $1,500. Jeff Cooper's trendy twist on the plain solitaire mounting lets your round, brilliant cut diamond take center stage, but gives it a bit of extra sparkle when viewed from the profile. The shank tapers to the diamond that sits in a swirled setting, accented by round diamonds. The mounting has a total diamond weight of .10 carats and is fabricated from 14k white gold, but it's also available in 14k yellow gold and platinum. It retails around $1,500, with the center diamond sold separately. This scrolled mounting by designer Kirk Kara combines cutting-edge style with a vintage feel. The mounting has round diamonds nestled throughout, showcasing the main gemstone. It is shown with a round, brilliant cut diamond, but it accommodates diamonds of varying shapes. The mounting shown is 18k white gold and is also available in 18k yellow and rose gold and platinum. The diamonds in the mounting total .07 carats. The ring retails around $2,600, plus the cost of the center diamond. This Kirk Kara 18K white gold diamond engagement ring setting has an avant garde, art deco vibe to it. The mounting has round blue sapphires, which are channel set on either side with round diamonds between them. The engraving and milgraining add vintage charm to the ring. The diamonds total .03 carats. The mounting is available in 14k and 18k white and yellow gold and platinum, and can fit almost any cut of diamond in the center. The mounting retails around $2,500. These designers, both experienced and new on the scene, are setting the trends for the modern engagement ring. New techniques create contemporary designs while vintage looks are given slick upgrades. Most designers offer custom options too, so there are plenty of ways to make your ring stand out.